September 11, 2001 was the world's wake up call. After the chaos and confusion, we awoke to the realization that life is a precious gift and that it is our responsibility as a citizen and human being to lead and live our best life. In the 21st century, we have better skills to deal with the darkness, and we are more enlightened and aware than ever before in history. Even still, it often has to get darker before it becomes lighter and brighter. But, in the modern world, we do not need to wait until something happens to cause us to change. In fact, you can choose to live a change-oriented, rich, and fulfilling life right now. To transform your life, you need to raise your awareness, practice pro-activity, and live by your vision, purpose, and values. The good news is that millions of people are consciously working on themselves, actively seeking healing on physical, emotional, mental and spiritual levels. Since we are all one, when we heal our self, we heal others, and ultimately heal our planet. Now is the perfect opportunity for you to step up to the plate and make a major contribution to the world. To begin the process, learn about the five steps to life transformation. The 5 Stages of Transformation Someone once said, "There is nothing about a caterpillar that tells you it's going to be a butterfly." This quote illustrates the change process perfectly. The butterfly represents a thing of great beauty. 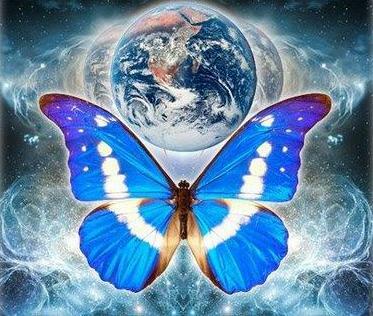 A butterfly completely transforms itself from a comfortable cocoon into a radiant entity with wings. You are like a beautiful butterfly waiting to be re-born and transformed. This stage is characterized by feelings of comfort, as you are beginning to awaken to the need to change. You begin to realize you could be so much more and recognize an error in judgment or dysfunctional patterns. This stage is characterized by feelings of discomfort, as you are beginning to stretch yourself, your abilities, your environment. You experience new ways of being and thinking and have the desire to transform yourself. This stage is characterized by feelings of panic and fear, as you are beginning to look, feel, and act differently. You have a gut instinct that this change will be good for you, and request that Spirit assist you & provide with you with guidance. This stage is characterized by feelings of confidence and courage, as you spread your wings to leave your old home to find a new home. You now recognize yourself as a beautiful creature, have excitement about future possibilities and you just do it. This stage is characterized by feelings of inner peace and joy, as you remember and realize who you really are. You now understand that you are a co-creator and possess the power to become whatever you want to be and do whatever you want to do. The Buttefly Patrol: "Don't Touch The Butterflies!" Butterfly Themed Wedding - Release The Butterflies! Planning a Butterfly Party The Kids Will Love!